The Annual Women's Memorial March is on February 14th. This is why I attend and why you should too. Grace J.M.W. Ouellette's book, The Fourth World: An Indigenous Perspective on Feminism and Aboriginal Women's Activism. Christina Coolidge is an Indigenous Program researcher with Career Services at SFU. In this four-part series she discusses the creation of the Sacred Trust Initiative (STI), with the purpose of stopping the Kinder Morgan pipeline expansion. This is the fourth post of the Tsleil-Waututh Nation and the Sacred Trust Initiative Series. Christina Coolidge is an Indigenous Program researcher with Career Services at SFU. In this four-part series she discusses the creation of the Sacred Trust Initiative (STI), with the purpose of stopping the Kinder Morgan pipeline expansion. This is the third post of the Tsleil-Waututh Nation and the Sacred Trust Initiative Series. Christina Coolidge is an Indigenous Program researcher with Career Services at SFU. In this four-part series she discusses the creation of the Sacred Trust Initiative (STI), with the purpose of stopping the Kinder Morgan pipeline expansion. This is the second post of the Tsleil-Waututh Nation and the Sacred Trust Initiative Series. Christina Coolidge is an Indigenous Program researcher with Career Services at SFU. In this four-part series she discusses the creation of the Sacred Trust Initiative (STI), with the purpose of stopping the Kinder Morgan pipeline expansion. This is the first post of the Tsleil-Waututh Nation and the Sacred Trust Initiative Series. Christina Coolidge is an Indigenous Program researcher with Career Services at SFU. In this four-part series she shares how Indigenous women are the keepers of language and discusses various issues and topics around language in the Indigenous community. This is the fourth post of the four part series. Christina Coolidge is an Indigenous Program researcher with Career Services at SFU. In this four-part series she shares how Indigenous women are the keepers of language and discusses various issues and topics around language in the Indigenous community. This is the third post of the four part series. Christina Coolidge is an Indigenous Program researcher with Career Services at SFU. In this four-part series she shares how Indigenous women are the keepers of language and discusses various issues and topics around language in the Indigenous community. This is the second post of the four part series. Christina Coolidge is an Indigenous Program researcher with Career Services at SFU. In this four-part series she shares how Indigenous women are the keepers of language and discusses various issues and topics around language in the Indigenous community. This is the first of the four part series. The Native Courtworker and Counselling Association of British Columbia (NCCABC) provides culturally appropriate services to aboriginal people and communities consistent with their needs. Acknowledging that white privilege exists is the first step to equality and justice for all. Are you an Aboriginal youth between the ages of 16 and 24? Do you have something on your mind you want to share? Learn more about the CUYSTWI and how you can enter. Marissa McIntyre grew up in Cloverdale, BC. She is currently a second year student here at SFU with a double major in First Nations Studies and Psychology. I write this in the aftermath of the explosive media wave that happened on Thursday October 17th, where I sat glued to my computer in shock at what was taking place across the country with my brothers and sisters. This peaceful blockade, set up as an example of unwavering Indigenous determination to protect our traditional territories and way of life, was under attack. My entire world was shattering, and I didn’t know what to do about it. On the 28th of September 2013, myself, Laura Forsythe and Loryn Blower all attended the Metis Nation of British Columbia Annual General Meeting in Richmond BC. It was a beautiful venue, small and intimate for the important proceedings and cultural connections that were taking place within. "The earth does not need us as we need her. I am grateful for this life and that I have the opportunity to stand with my brothers and sisters." Christina found 50 ways to help the planet for future generations. The First Nations Student Association is hosting an evening with best-selling author Calvin Helin on October 24th at Harbour Center. Attendance is free and open to the public. I love thoughtful and passionate debate. Especially about things that are important to me and those around me. I consider myself a Canadian citizen and because of that, I practice my right to vote. I posed the question of the Indigenous vote and was met with several interesting and thought-provoking debates regarding the subject. I admit I had some misgivings about the Truth and Reconciliation events happening in Vancouver this week. There are so many layers to unravel and so many systems involved that I couldn’t decide where I belong. I took some time to reflect on what the purposes of the Truth and Reconciliation Commission are, as well as who I am, in order to make a decision on whether or not to participate. The group, A Tribe Called Red combines traditional powwow music and electronica, to create a unique sound made of both, the spiritual element of drum and voice, as well as the more culturally mainstream sound of electronica. In present day Western civilization, simply taking a walk down a busy street and paying attention is enough to grasp the magnitude of the promotional society in which we live. A response to a column featured on page A6 of the Province newspaper on July 31st, entitled First Nations need to quit blaming the past, written by Naomi Lakritz. The First Nation Education Act is due to be passes September, 2014. It may not be all that its cracked up to be. Saahiilthit (Gerry) Oleman, an elder of the Stl’atl’imx Nation shares his teachings with Aboriginal students about education. Mary Temple will be continuing her degree at SFU in the fall. Read about her experiences growing up in northern BC and where her education has taken her thus far. June is Aboriginal History month. It is an opportunity to share, not only the troubling reality behind the Aboriginal/Canadian relationship, but to understand the impactful and important contributions to Canadian society by the Indigenous cultures of this country. As I watched my Mother walk across the stage accepting handshakes and hugs along with her degree, I started to wonder how well we really ever know a person. My Mom, now a University graduate, has been so many different things in my life, but how well do I really know this woman? Sandy Coolidge is over 50, a mother of three, and now a graduate of NVIT's social work program. She shares her experiences as a Metis woman and student. To grow your career you need to know what’s available where you are! Checkout what’s happening in your own area. Opportunities for growth differ in various sectors across the country, and career trends are always changing, so you need to keep up. Coqualeetza Cultural Education Centre has the main purpose of promoting, preserving and interpreting Sto:lo Lifestyle, Language, Traditions, and Heritage, from the Sto:lo point of view. Earning the Duke of Ed Award looks great on your resume as it shows you are a well rounded individual who is connected to the community. It’s a great way to explore your interests and try something new. 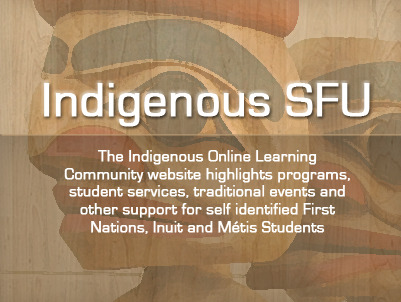 Indigenous students transitioning to post-secondary often face unique challenge, which is why it's important to learn about all the community resources and scholarships avalible to Indigenous students at SFU. Christina shares her experience in leading a group of Aboriginal high-school students through a tour of SFU, where they discussed the troubling statistics of Aboriginal student drop-out rates and the potential for their future. The Idle No More movement has gained strength in numbers and momentum primarily through Facebook, Twitter and Youtube. By sharing ideas, goals, and opinions we have begun to destabilize those institutions to which we are vulnerable. Fractured Land: The Story of Our Nation at a Crossroads. The University of Northern British Columbia is partnering with the National Association of Friendship Centres (NAFC), government ministries, and regional research centres across Canada to develop the Urban Aboriginal Knowledge Network (UAKN) and research the policies and issues that affect Canada’s city-dwelling aboriginal population. Investing in First Nations is not only a benefit to the social, cultural and economic well-being of First Nations communities, it is also a long-term and sustainable stimulus plan for Canada’s economy. Statistics Canada has predicted that Canada will face a labour shortage by 2017 as baby boomers retire and there are fewer workers to replace them. The Vancouver Aboriginal Friendship Centre, a non for profit charitable organization, has been meeting the needs of aboriginal people making a transition to the urban Vancouver community since its doors opened in 1963. Read about one 17 year-olds summer experience. We believe there is a need to restore the traditional Aboriginal values of honour, respect and equality. The Circle of Life includes elders, lifegivers, men, and youth. All have a right to live in non-violent families and communities. Vancouver Indigenous Media Arts Festival is an Aboriginal-run media arts organization rebuilding the West Coast’s film, video and media arts festival. The organization endeavours to develop a crucial piece of infrastructure that has been missing from the Aboriginal cultural sector, as well as British Columbia’s creative industries. Beat Nation: Hip Hop as Indigenous Culture is a website that focuses on the development of hip hop culture within Aboriginal youth communities and its influence on cultural production.